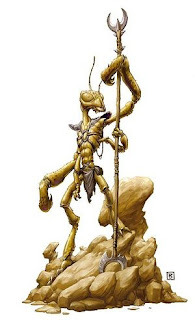 A Thri-keen player character has mandibles and may bite a creature, dealing 1d4 damage. Additionally, due to their chitinous shell they gain -1[+1] to Armor Class. Thri-Keen player characters must be Clerics, Druids, Fighters, or Rangers. A Thri-keen that is solely a Fighter may take advantage of any XP bonus due to a high Strength score to gain experience more quickly. They may also be Fighter-Clerics levels. Thri-keen advancing in more than one class are limited to 4th level Fighter (5th level with Strength of 17, 6th level with Strength of 18) and 8th level Cleric (9th with a Wisdom of 18). Regardless of any further progression in levels as a Druid, Thri-Keen are able to cast magic spells only as high as 5th-level spells.